This is a barn find that started a car on its journey back home. 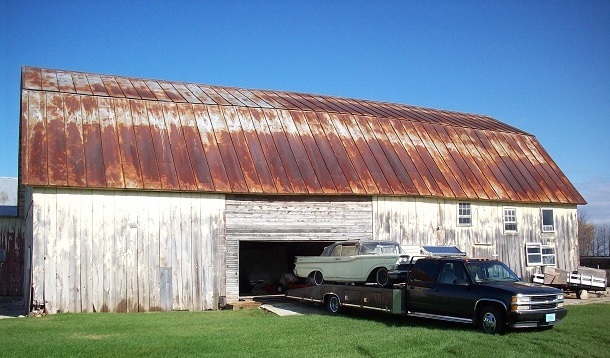 Hidden away in a barn in Greenleaf, WI that belonged to Harland Rusch were four cars: A 1975 Olds Convertible with 18,000 miles, a 1974 Buick Riviera, a 1975 Olds Delta 88 and a 1959 Mercury Monterey Convertible that was sitting for about 30 years. All of the cars were well maintained in the barn - they were covered and they were started on occasion. The Mercury Monterey was purchased from De Pere Auto by MoPar collectors Bob Brown and George Collar. The car was in very nice original condition when they purchased it, but showing some age. They had the car repainted, the bumpers rechromed and new tires put on by De Pere Auto. The car was entered in Concours d'elegance in Detroit and it showed very well. A collector and dealer named Andy Budd saw it there and contacted Bob and George. Budd grandmother, Donna Budd had one and he always wanted one. While talking about the car, it was discovered that this was the Mercury that his grandmother originally owned. She purchased the Madeira Yellow convertible off of the showroom floor in 1959 and named the car "Petunia". She kept meticulous records on the car, including recording when she filled up the tank. It was owned by Budd's grandmother until she could no longer drive. She gave the car to him, but it was too nice of a car for a young man to drive and the money was better used for grandma's living expenses. He promised his grandma that one day he would get the car back. The car passed hands a couple of times and Harland Rusch bought the car in Heshey, PA. Budd had lost track of where the car went until it finally resurfaced again. After several attempts to purchase the Merc from Bob and George his persistence paid off and he kept his promise to his grandmother.